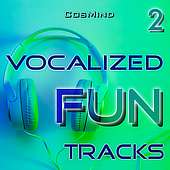 Fantastic Volume "2" of CosMinds trendy and catchy "Vocalized Fun Tracks" compilation. Stylish, fresh and uplifting hooks from Pop & Dance to Scatman Retro Grooves with processed and pitched vocals, bright & groovy beats. Energizing and positive. Also included the exciting and valuable instrumental versions. A modern fun-driven collection perfect for youth lifestyle, advertising, fitness, fashion, shopping, cooking, cosmetics, beauty, party, youth TV serials, teen drama, dramedy, comedy, kids programs, daytime TV, magazines, promos, trailer, ads, commercials. All titles created by the outstanding and award-winning Mungo Parc.